Maximum voltage switch SCHNEIDER, A9A26500, iMSU, 1P + N, 230VAC, iC60 Maximum voltage switch SCHNEIDER ELECTRIC, single phase + N, model A9A26500, rated voltage 230 VAC for DIN rail. Minimum voltage switch SCHNEIDER, A9A26969, iMN, 220-240VAC, iC60, iID Minimum voltage switch SCHNEIDER ELECTRIC, 220 - 240 VAC, model A9A26969, for DIN rail. Minimum voltage switch SCHNEIDER, A9A26960, iMN, 220-240VAC, iC60, iID Minimum voltage switch SCHNEIDER ELECTRIC, with 220 - 240 VAC, model A9A26960, for DIN rail. 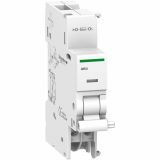 Miniature circuit breaker DZ47-63DC, 1x63A, curve C, DIN rail The miniature automatic circuit breaker has 63 A rated current, 750 VDC rated voltage, trip curve C with maximum tripping current of 630 A.
Miniature circuit breaker 1x40A Multi9 NANTE DIN rail curve C The automatic breaker has rated current through the contacts 40 A, rated voltage 240 VAC / 415 VAC, tripping time under 0.1 s and a maximum short circuit current of up to 6000 A. List Price: 2.20лв. VAT Incl. 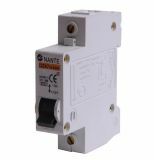 Miniature circuit breaker, 1x63A, EAZ MB-C63, DIN rail, curve C The automatic breaker has rated current through the contacts 63 A, rated voltage 230 VAC / 400 VAC, tripping time under 0.1 s and a maximum short circuit current of up to 6000 A.
Miniature circuit breaker 1x1A DZ47 DIN rail curve B The miniature circuit breaker has rated current through the contacts 1 A, rated voltage 230 VAC, response time under 0.1 s and a maximum short circuit current up to 6000 A.
Miniature circuit breaker 1x2A DZ47 DIN rail curve B The automatic breaker has rated current through the contacts 2 A, rated voltage 230 VAC, response time under 0.1 s and maximum short circuit current up to 6000 A.
Miniature circuit breaker 1x4A DZ47 DIN rail curve B The automatic, miniature breaker (MCB) has rated current through the contacts 4 A, rated voltage 230 VAC, tripping time under 0.1 s and a maximum short circuit current of up to 6000 A.
Miniature circuit breaker 1x6A DZ47 DIN rail curve B The automatic, miniature breaker (MCB) has rated current through the contacts 6 A, rated voltage 230 / 400 VAC, tripping time under 0.1 s and a maximum short circuit current of up to 6000 A.
Miniature circuit breaker 1x25A DZ47 DIN rail curve C The automatic breaker has rated current through the contacts 16 A, rated voltage 230 VAC, tripping time under 0.1 s and a maximum short circuit current of up to 6000 A. List Price 2.95лв. VAT Incl. 2.80лв. VAT Incl. 2.65лв. VAT Incl. 2.50лв. VAT Incl. Miniature circuit breaker 1x25A DZ47 DIN rail curve C The miniature circuit breaker has rated current through the contacts 25 A, rated voltage 230 VAC, tripping time under 0.1 s and maximum short circuit current up to 6000 A. List Price: 3.90лв. VAT Incl. Miniature circuit breaker 1x32A DZ47 DIN rail curve C The automatic breaker has rated current through the contacts 32 A, rated voltage 230 VAC, tripping time under 0.1 s and a maximum short circuit current of up to 6000 A.
Miniature circuit breaker 1x40A DZ47 DIN rail curve C The automatic breaker has rated current through the contacts 40 A, rated voltage 230 VAC, tripping time under 0.1 s and a maximum short circuit current of up to 6000 A.
Miniature circuit breaker 1x50A DZ47 DIN rail curve C The automatic breaker has rated current through the contacts 50 A, rated voltage 230 VAC, tripping time under 0.1 s and a maximum short circuit current of up to 4500 A. List Price 3.80лв. VAT Incl. 3.61лв. VAT Incl. Miniature circuit breaker 1x63A DZ47 DIN rail curve C The automatic breaker has rated current through the contacts 63 A, rated voltage 230 VAC, tripping time under 0.1 s and a maximum short circuit current of up to 4500 A.
Miniature circuit breaker 1x80A CDB2-125 DIN rail curve C The automatic breaker has rated current through the contacts 80 A, rated voltage 230 VAC / 400 VAC, tripping time under 0.1 s and a maximum short circuit current of up to 10000 A. Circuit breakers (MCB) are electromechanical components in the electrical circuit, which are designed to protect from damages caused by overload, low voltage or short circuit. The two main components of the circuit breakers are thermal and electromagnetic switches. The first is used for protection of a current flow with greater than the nominal value for a longer period, and the electromagnetic switches - to prevent short circuits. Depending on the field of applications, circuit breakers are two types: for low and for high voltage. The values of the switches for low-voltage does not exceed 1000 volts. Depending on the number of poles ranging from 1 to 3, circuit breakers may be single phase, single phase with a zero interruption, three phase, etc. VIKIWAT Ltd. Plovdiv offers a great assortment of circuit breakers and switches from worldwide leading manufacturers at the best prices! Shop online and get a discount!